(Nanowerk News) Researchers from Aalto University have published an article in the recent Trends in Biotechnology journal ("DNA Nanostructures as Smart Drug-Delivery Vehicles and Molecular Devices"). The article discusses how DNA molecules can be assembled into tailored and complex nanostructures, and further, how these structures can find uses in therapeutics and bionanotechnological applications. In the review article, the researchers outline the superior properties of DNA nanostructures, and how these features enable the development of efficient biological DNA-nanomachines. Moreover, these DNA nanostructures provide new applications in molecular medicine, such as novel approaches in tackling cancer. Tailored DNA structures could find targeted cells and release their molecular payload (drugs or antibodies) selectively into these cells. “Nowadays, software and techniques to design and simulate DNA nanostructures are extremely powerful and user-friendly, and thus, researchers can easily construct their own DNA-objects for various uses. The big boom in the field of structural DNA nanotechnology happened in 2006, when Paul Rothemund introduced a technique dubbed ‘DNA origami’. This method is the starting point for practically all other straightforward design approaches available today”, describes Veikko Linko, an Academy of Finland postdoctoral researcher from Biohybrid Materials Group. The most important feature of a DNA-based nanostructure is its modularity. DNA structures can be fabricated with nanometer-precision, and most importantly, other molecules such as RNA, proteins, peptides and drugs can be anchored to them with the same resolution. Such a high accuracy can be exploited in creating nanosized optical devices as well as molecular platforms and barcodes for various imaging techniques and analytics. Furthermore, the researchers from Aalto University and University of Jyväskylä have recently shown how DNA origamis can be used in efficient fabrication of custom-shaped metal nanoparticles that could be used in various fields of material sciences. For molecular medicine, tiny DNA-based devices could be utilized not only in detecting single molecules but also in modulating cell signaling. In the near future, highly sophisticated DNA-robots could be even used in creating artificial immune systems. A system based on tailored DNA-devices could help to avoid unnecessary drug treatments, since programmed DNA-nanorobots could detect various agents from the blood stream, and immediately start the battle against disease. The research group lead by Professor Mauri Kostiainen works extensively with DNA nanostructures, and the group has just recently published two research articles regarding DNA-based applications in biotechnology and molecular medicine. 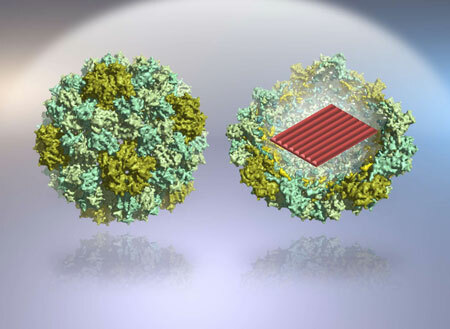 The researchers have coated DNA nanostructures with virus capsid proteins in order to significantly improve their transport to human cells; this could find uses for example in enhanced drug delivery. In addition, the group has designed a modular DNA-based enzymatic nanoreactor that can be exploited in diagnostics at the molecular scale level.